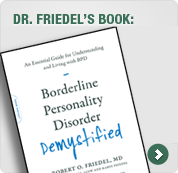 Borderline Personality Disorder Demystified provides a comprehensive and authoritative source of information for people who have or think they may have borderline disorder, and for their families (take Online Test and receive immediate results). The material in this book is considerably more extensive and detailed than that which can be provided on this website. It is likely that you will need much of this information as you seek and progress in treatment.